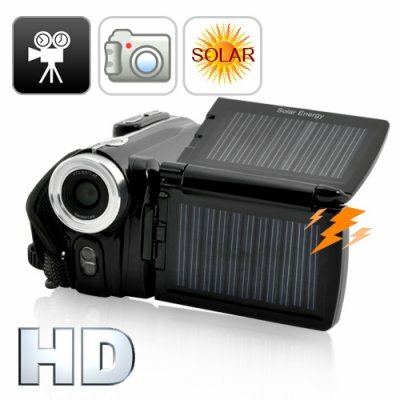 Successfully Added Solar Camcorder with Dual Charging Panels (720P HD) to your Shopping Cart. Introducing the world's first HD Camcorder with Dual Solar Charging Panels. Small and compact, this solar HD Camcorder fits perfectly inside the palm of your hand and was specifically designed for maximum convenience while you are outdoors filming your picnic or scenic videos. With just your right hand, you can control every function and gain access to: 720P HD(1280x720) video recording, photos up to 12MP, crystal clear audio recording, and instant playback on the 3 inch swivel screen. There's no need to worry about battery life on this Solar HD Camcorder: The back of the screen includes two solar charging panels that can provide constant power to the rechargeable li-ion battery. Extremely simple to use and convenient, this HD Camcorder is the ideal all-day use camcorder - just flip the solar panels up and it will start charging instantly under any light source. The dual solar charging panels are at work even when the Solar HD Camcorder is turned off, so you can be sure it is ready for use the second you turn it on. It is only fitting that the all-day use of the Solar Camcorder with Dual Charging Panels (720P HD) is complemented with a free 4GB SD card that provides plenty of space to store all the day's events. If it's not enough, just easily swap in your own SD card (up to 32GB). You can then playback all your files directly on the 3 inch screen, transfer them to your computer for future later viewing, or even connect the AV-Out or HDMI connection for viewing on your large screen TV. A super low priced and easy way to record video all day long, this Solar Camcorder with Dual Charging Panels (720P HD) is available at a family-friendly budget price. Stocked in our warehouse now, order today and we'll express ship it out tomorrow. Brought to you by the leader in China Electronics - Chinavasion. How long will this camcorder take to charge using solar power? In full sunlight, the dual solar panels (120 mA) can fully charge the 3.7V 1500 mAh battery in around 6-7 hours. I see that I can use 4x AAA batteries to power this solar camcorder, will the solar panels charge that too? No, the solar panels are only for charging the li-ion battery. Спасибо! Быстрая доставка. Отличный товар, все характеристики соответствуют.